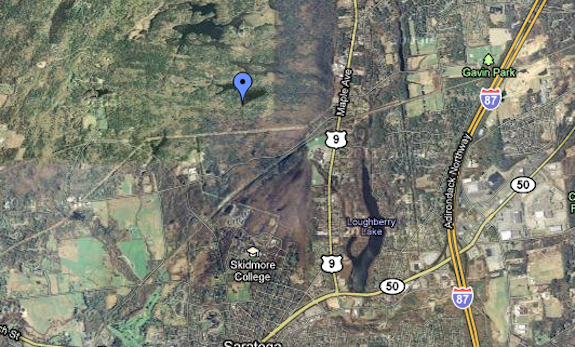 Skidmore College: Now With More Acres! Michael and Margaret Roohan, owners of Granite & Marble Works, Inc. of Wilton have generously donated 200 acres of undeveloped property to The College. Lets all take a moment to send thank you vibes their way….good. The 200 acre parcel, located to the north of Daniels Road and west of Route 9, is non-contiguous with the campus and brings The College’s total property holdings in the towns of Greenfield and Saratoga to nearly 1,000 acres. The Roohans have also hinted at another possible 400 acre donation at some point in the future. While the donation carries no technical stipulations Mike Roohan did tell the Albany Times Union he thinks “the highest and best use of the land is not to develop it.” The donated property is mainly wilderness filled with wetlands, rock outcrops and forest. The college’s official statement on the future use of the property—“We will carefully examine the options that ownership of this property gives us. Although the site is not directly adjacent to the campus or our North Woods, it is very close to the college and is already of great interest to our faculty and students in a wide range of courses”—suggests that the new Roohan acres will be used for student research while remaining accessible to the public, much like the North Woods property. The College is not filing for tax-exempt status on the property, which would leave the property on the Greenfield tax rolls, a relief to the Greenfield tax payers (Jesus, I’m turning into my father).